With St. Patrick's Day in a few days, it's the perfect time to bring together some of the best March wedding ideas from around the web! From DIYs to inspiration boards to delicious recipes, we've rounded up some great golden nuggets for you! 1. Lucky in love! If you hadn't already seen our shamrock-inspired bridal shower last week, definitely take a peek because it's too perfect for a March bride! 2. Oh, emerald green, I love you. And it's so beautifully used in this real winter wedding on Mountainside Bride! 3. 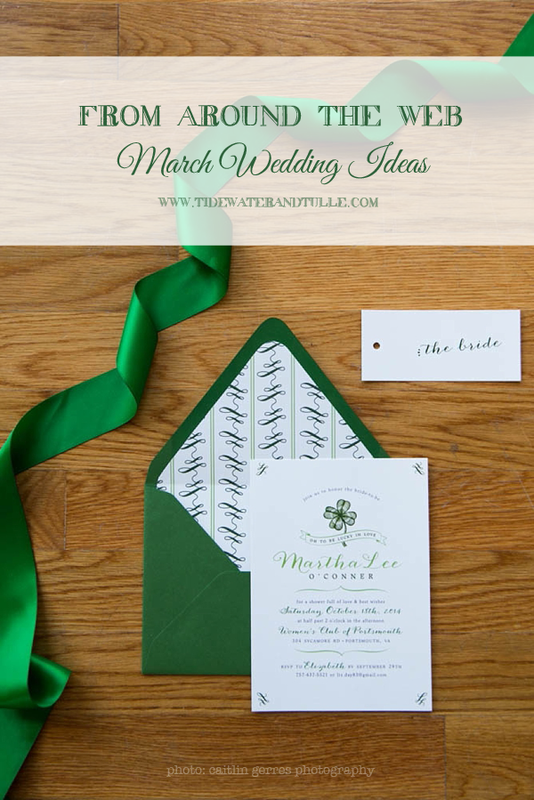 You can't get much more St. Patty's Day than this green and white inspiration board on Brenda's Wedding Blog. 4. Guinness and cake? Yep, it sure is! This Irish Countryside Groom's Cake recipe on Classic Bride is going to make all people drool whether it's for a groom's cake or justfortheheckofit cake. 5. A whole lot of green with dashes of gold make up this classic wedding inspiration board on Budget Fairy Tale without being too St. Patrick's Day. 6. Our blog neighbor to the north has the sweetest nautical real wedding that pays homage to a couple's Irish heritage! The Sláinte koozies are a must see on United with Love. 7. This adorable green DIY cross-stitch table number on Something Turquoise would be perfect for a vintage or handmade wedding! 8. You'll be seeing green for days! Gorgeous South Asian wedding fashion, details, and more all in shades of emerald, lime green, and olive are all on The Big Fat Indian Wedding. 9. Love the color mint but want a refreshing take on the hue? This beautiful minty wedding inspiration board from Burnett's Boards makes trendy into timeless. 10. It may be a botanical-inspired real wedding, but between the giant, epic golden horseshoe above the bar and gorgeous greenery, this wedding on Style Me Pretty is just too perfect for a St. Patty's day inspiration. Photo by Caitlin Gerres Photography. For the full shamrock bridal shower inspiration, head over to the full feature.